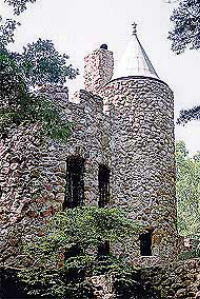 Gimghoul Castle was built from about 1920 to 1926. It was originally called Hippol Castle. At the time, construction cost $50,000. Visit another webpage with more information by clicking here. Take Highway 54 West into Chapel Hill- at the first light at the top of the Hill, take a right, and then take the first right you come to- Gimghoul Road. Go all the way to the end- about a mile or so- and you'll see the private dirt road of the castle, as well as the church parking lot there on your right. Parking in the neighborhood is limited on the streets during the week, because the home-owners don't want students taking over the streets, natch, so you're on your own when it comes to finding a suitable place to leave your vehicle. The church, too, frowns on non-approved vehicles stopping on their property. You'll be able to see the castle through the trees, and the cliff is between the castle and Highway 54.